To be honest, I’m not very familiar with text adventures, but I’ve been getting a bit more interested in them lately. This is partly because I love reading science-fiction and fantasy novels. Playing a text adventure game is a bit similar to reading, but with the additional option to interact and take part in the storyline. I’m definitely going to try out one or more of the games listed above. Are there any text adventure players out there? If yes, then please leave a comment below. Would love to hear about your favourite games and what you like about the genre. Previous Amiga Future: Issue 95 is out now! Many thanks for the link. 🙂 The interface in the Flash-version looks handy. This is a great find as I was seriously considering purchasing the Zork series on GOG.com, but with the original guys who worked on the game not getting the $$$, I feel these games really are public domain. 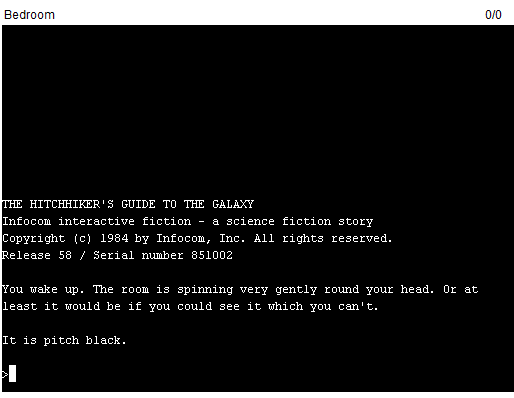 Zork is still my favorite because it seemed more “fair” than Hitchhiker’s Guide to the Galaxy. At the same time, the humor, when it worked, was much better in HGG. Many thanks for your comment. 🙂 Great stuff, I’m going to check out that game. Thanks for the heads-up! Will let you know how I liked it.